Aston Villa have been fined £60,000 and warned about their future conduct following their players' behaviour in the 1-0 defeat by Leicester. 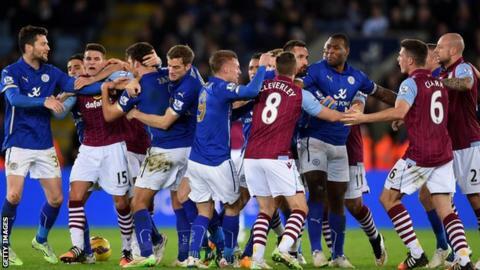 Players and club officials clashed on and off the pitch in a game that saw Leicester's Matty James and Villa's Ciaran Clark sent off. Both clubs admitted a Football Association charge earlier this month and Leicester were fined £20,000. It is Villa's third fine of the season for the offence. They were fined £20,000 and £30,000 for failing to control their players in games against Tottenham and Manchester United respectively.